If you are one of those hundreds of people out there who loves to shop online, the I've had a good news for you. CouponChief.com is one website where you could find coupon codes for almost all the online shopping websites. These digital coupons will help you in saving a huge amount of money and you can shop as much as you want and that too totally guilt free. You can search for coupons directly without any signing up or registering for the website. 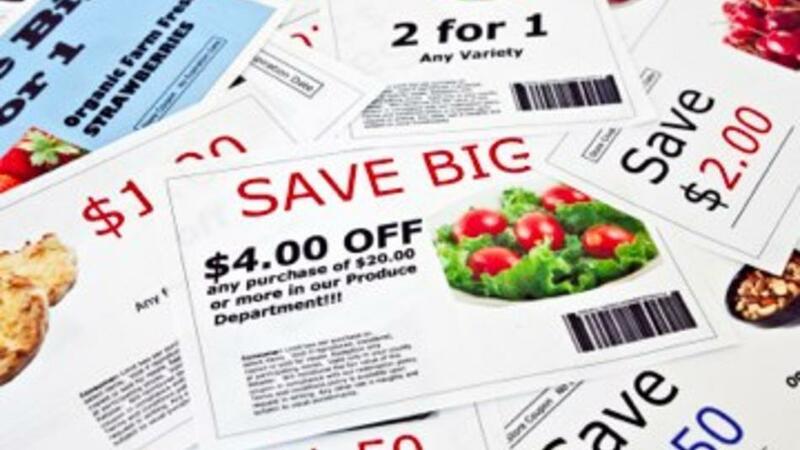 Nowadays even online retailers have given the opportunity to apply coupons by entering a coupon code in the box provided at the time of check out. For instance, you can avail discount of 10% or more, depending the coupon code that suits you. Using Coupon Chief coupon codes is a simple three way step. Step one, open CouponChief.com in your browser. Step 2, Enter you service store in the search box provided. Step 3, Copy the coupon code of your choice on the clipboard. Now you can go to your online website’s checkout page and paste the coupon code copied in the coupon box provided by the retailer. If you are in search for some really cool deals and discounts you can simply browse CouponChief.com. You have also search criteria like featured stores, popular coupons etc. there is even a tab “Stores” where you can look up and go to your favorite store, fetch its discount coupons and use them. CouponChief is also offering a Pay-2-share program where money is given to all who upload coupon codes. So if you have some valid coupons and believe in sharing then do so and earn some bucks with your humble gesture. 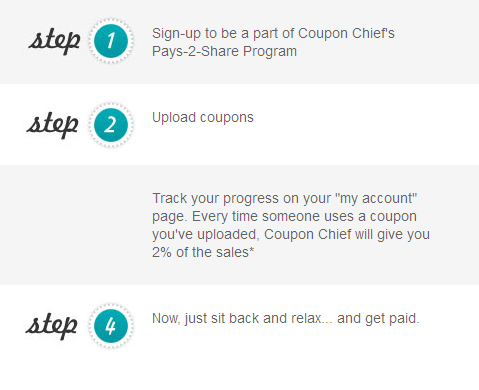 Below I am giving you the steps to sign up for uploading coupons. I would suggest that using CouponChief is must for all the online shopaholics. It is simple and worthy to use for innumerable online stores. CouponChief have saved money of several people and you could be one of them. 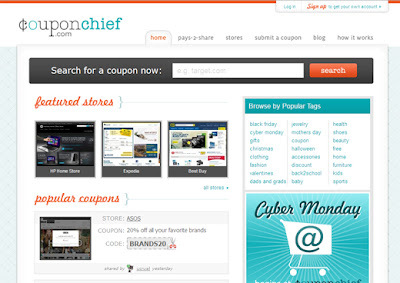 Before even moving to your shopping website, just enter CouponChief.com in your browser and enjoy its coupons.